Last year, when I was experiencing severe (I referred to them at the time as “killer”) headaches, I quickly got my end-of-life paperwork in order. My mom, at the age of sixty-nine – three years younger than I am now – died in 1984 of glioblastoma, the same aggressive and still-incurable form of brain cancer that John McCain was recently diagnosed with and Ted Kennedy and Beau Biden died of. I was convinced then, because my headaches, which felt like spikes being pounded into the back of my skull (the same location my mother pointed out on her own head before she received her terminal diagnosis), and because I’ve always suspected that glioblastoma was stalking me, that it was now my turn. I was wrong about that. My headaches, seemingly stress-related, have since diminished; and as far as I know, glioblastoma’s hairlike tendrils have not found their way into my brain. But it’s a sure thing that I, like all those in my age-cohort, will die of something someday in the not-too-far-off future. I’m just grateful that my brain cancer false alarm forced me to do all my homework in advance of that day. 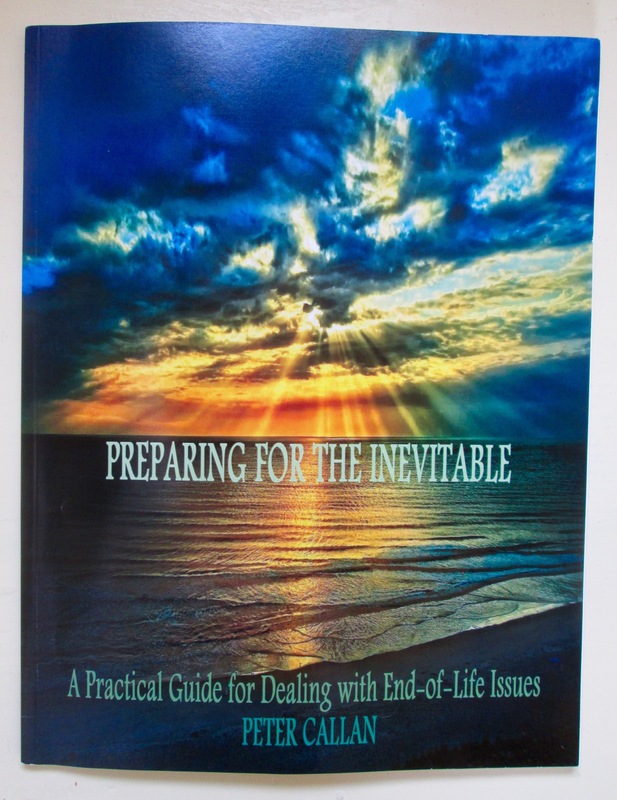 Speaking of this kind of end-of-life homework, a former writing student of mine at UNM-Taos, Peter Callan, has written an invaluable workbook, titled Preparing for the Inevitable: A Practical Guide for Dealing with End-of-Life Issues. When he was my student and he told me about his book idea, with the early title of Prepare to Die!! !, I thought: Good luck with that! I feared that most readers (a dying breed, I’ve got to say) tend to avoid such downbeat, Grim-Reaper-ish topics, preferring instead to be buoyantly entertained. But Peter’s book, I’m glad to report, is now in its ninth printing. It clearly fills an important need, which readers seem to appreciate. Just shows you how wrong I can be. If I hadn’t already made such preparations — writing and revising my advance directives last year — this is the workbook I would want to have and to follow. Peter is a certified paralegal, not an attorney, and he doesn’t pretend to have all the answers; but his guide is a great start. He is thorough, encouraging, and even humorous. To order a copy of Preparing for the Inevitable, go to Peter’s website: www.LifeIZshort.com or reach him by e-mail at sobeitt@hotmail.com or by phone at 808-854-5635. It’s been thirty-three years since my own mother’s death, and I still have not been able to write about it, other than in a passing mention. When my mind returns to those harrowing, heartbreaking memories, my heart tends to fill with bile. She had no advance directives in place — did such things even exist then? – so I was forced to watch helplessly as the American medical professionals took over, keeping her alive long after she would have wanted — long after her quality of life on a scale from one to ten was less than zero – out of, it seemed to me, their own greed of gain and fear of death (masquerading as “heroism”). I cannot go there, still. I’m just thankful to be living now in an old, wise country that accepts death as a normal part of life and doesn’t try to capitalize on keeping people alive when Nature would choose otherwise. And I’m especially glad to have all my end-of-life directives in order.